Audio and visuals, the collaboration between these two elements creates an overwhelming artistic experience for musicians and the audience. The innovative s VJ software (Win/Mac), “motion dive .tokyo” by Digitalstage, and EDIROL/Roland join forces to offer an intuitive and powerful package for artists. This package (Model Code: MD-P1-S) includes the motion dive software and a sleek console unit for intense live performance. Achieve complete music integration by connecting EDIROL/Roland V-LINK compatible instruments. 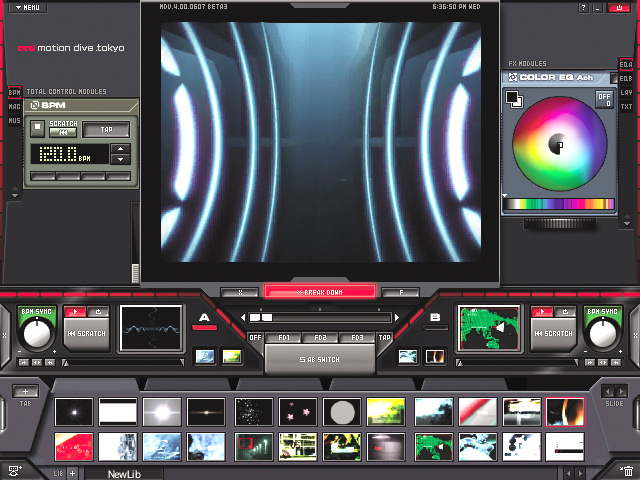 From its first appearance in Japan in 1998, the software "motion dive" has played an important role to spread the hybrid culture of motion graphics and music across the globe. Like DJs mix their music and cultivated a new music generation in the past, "motion dive" has been opening a new door to the VJ scene for a new VJ visual generation. Now "motion dive. tokyo" new release is ready. This software gives you a major function that mixes the 2 visuals into 1 visual for your live visual performance. You can add visual effetcs and texts as you need. Also, you can easily organize the video files and send the video source diretcly from your computer. It gives you functions for the video mix. "AB switch" button allows you to mix and switch the visuals between channel A and B. You can manually or automatically cross-fade between the channels. 2 visuals are set for ready on the 2 active windows on the each channel. While "TAP" button next to the "AB SWITCH" is on, you can click 2 times on the "AB switch" by any length of the time, then the visuals keep being switched between A and B. Once music BPM is set by "BPM" on the upper left side, you can synchronize the length of the visual by pressing the "BPM SYNC" button. You can suddenly fade out the visual on the main active screen by pressing the "breakdown" button. The visual is restarted from the scratch by the "SCRATCH" button. You can adjust the length and the start/end points of the visual. You can enlarge the visual into full screen. TUNE is a plug-in system for "motion dive .tokyo". 6 TUNE are ready to use from the original package. There are many of various TUNEs which are lined up to be released. You can load all kinds of files into motion dive. "motion dive .tokyo" is compatible to the industry standard formats, Quicktime movie files, all the digital camera pictures, and Adobe Photoshop still picture files as well as macromedia Flash MX (Action Script capability). It allows you to make your own visual library too. Theoretically speaking, motion dive is compatible to any resolution of the visual. It depends on the power of the computer. If your computer is able to provide you a dual display, you can projetc the visuals diretcly from the computer to output devices (TV, projetcor, etc.) by maintaining preview interface on your computer monitor. It's active once you just drag the main visual window onto the 2nd monitor. You can lively record the visuals in the "motion dive .tokyo" onto DVD, VCR or HD recorder by using this dual output system.